Monday After supper in the early evening of April 2, Verne’s wife received a telegram from the War Department. It was the day after Easter. 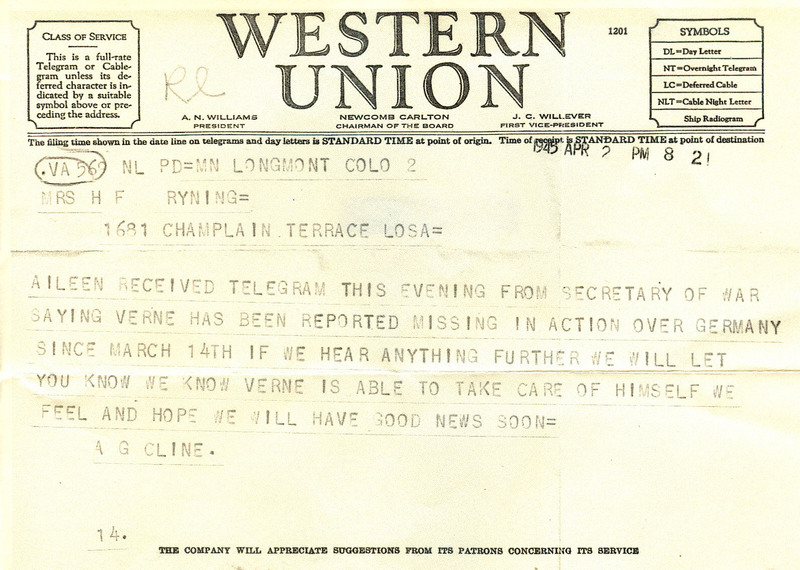 The telegram stated that Verne had been missing in action since March 14. It had been almost three weeks since his B-17 had been hit by another over Germany. She was living with her parents while she waited for his return. Verne’s father-in-law drove to the local Colorado and Southern Railway depot, the location of the town’s telegraph office. The sun with its twilight shadows had already gone down over the Rocky Mountains. There, he sent a telegram to Verne’s mother. The telegram went out a 8:21 p.m. It was 7:21 p.m. in Los Angeles where Verne’s mother lived. It had been a nice day in Los Angeles, but now the sun was beginning to set there too. This entry was posted in Uncategorized and tagged telegram. Bookmark the permalink. I feel like we know before his wife and mother…..
It’s hard to click the ‘Like’ button on a post like this…. Sometimes, faded pieces of paper can evoke powerful emotions. The piece of paper all mothers and wives feared the most. Devastating to receive. In Great Britain, how were families notified that their family members were missing in action, prisoners of war or dead? As far as I’m aware the same way, a telegram sent to the next of kin. In addition a letter would sometimes be sent from a commander giving a more ‘personal’ touch. There’s a copy of one of the telegrams notifying of ‘Missing in action’ on the Lesley Howard post. It is so cool that you do this. Me, my wife, and daughter are here reading today and yesterdays posts and we feel like we are back in time re-living the emotion of the event. I’ve often wondered how heavy the hearts must have been of those who delivered such telegrams. In the small towns of America, did the local telegraph office hold deliveries until certain times of the day or did they deliver the telegrams as they arrived? Interesting question. My father was postmaster of a small village post office in rural North west Ireland. As a child I often headed out on my bike to outlying areas to deliver telegrams with the awful news that someone had died. When the telegram arrived, it had to be delivered as a matter of urgency. I presume that such telegrams advising of war casualties would have been dealt with in similar fashion. What do you think? I suspect that the telegrams were delivered as they came in or that they were accumulated and delivered on a scheduled basis. The idea of these telegrams is used in all war movies. But this one is real and so much more devastating. Thanks so much for the post. And now I’ve just noticed the date on the top of your blog. I will wait for your post on April 24th. Someone who lived during those times once told me that every time a telegram was delivered their heart paused. The feeling of not being able to do anything to save him must have been indescribable. I can but hope I will never need to experience it. It is impossible to understand what Verne’s wife must have felt. This is an extremely moving post.